Hooray! My blog has won an award. Thank you to Ladii Aponte at "Through My Eyes", who awarded me with the "Stylish Blogger Award". Thank you Ladii~! You're AWESOME. 1. I am a high school business teacher, but that was never my dream job. 2. BJ does cry sometimes, but I highlight his smiles. What can I say... he's a baby, right? Yes, BJ does cry, but I'm too busy making sure he's not crying to take pictures of these moments. I am so thankful because he actually doesn't cry that often. In fact, I don't remember him sobbing much lately. He's actually a really good baby. 3. Although HJ and I are from the same island, we met in college on a different island. Not much of a secret to my close friends and family, but yes we didn't meet until college, even though we're both from Maui. What's even funnier is that we had mutual friends before we met, but hadn't heard of each other until that day. It's kind of weird how it all works out. Who would've known that when we met that day in the back of his best friend's pick up truck, seven years later we'd be married with a baby! 4. I don't really know who reads my blog. 5. I read everyone's blog that I follow. Yes. You read right. I follow everyone who follows me, plus others whom I feel write about exceptional things, and I read every one of them in my google reader. Sometimes, it can take me an hour or two to get through all of them, but I read what everyone wrote since they took the time to write it. I hope people will do the same for me. Plus, I love reading blogs. Okay, all done! Thank you again, Ladii Aponte, for the award! Now it's my turn to pass on the award. 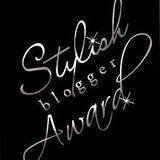 Here are five blogs that I feel are stylish and deserve the "Stylish Blogger Award". Congratulations~! Now off to eat dinner with HJ, BJ, and my parents. Have a wonderful 3-day weekend everyone. Well as You can see I just Read yours! I try and get around to reading every ones even the giveaways Lol Lately im just so busy and weekends are the worst! I got home to type up my blog around 730 ish and didnt finish till almost 9 so i could upload photos and such so i wouldnt have to Post twice! I never considered JC a possibility to even dating Me lol and look at us now going on 3 years of marrieage with a 20 month old! it is funny how things work out! Awwww thank you girl!! And thanks for reading my little ol' blog too! What a cute blog! I'm glad I found you from the blog hop. I'm your newest follower! Your little guy is absolutely adorable! I look forward to reading your blog. Hello, Howdy, Hi I am a new follower. I would love for you to follow me also.